Many of the videos that you record will undoubtedly be saved as MP4 files. It is essentially the most popular format nowadays, due to the fact that it is widely compatible with many devices as well as platforms. More importantly it is a good format for various types of compressions, including the exceedingly popular H.264 codec. That being said despite the quality of MP4 videos in general, they still do need to be edited in order to create impressive content. While most video editors are capable of editing MP4 videos, it can be complicated to do so – especially if you don’t have much experience using them. Because of that you should consider using Movavi Video Editor instead. 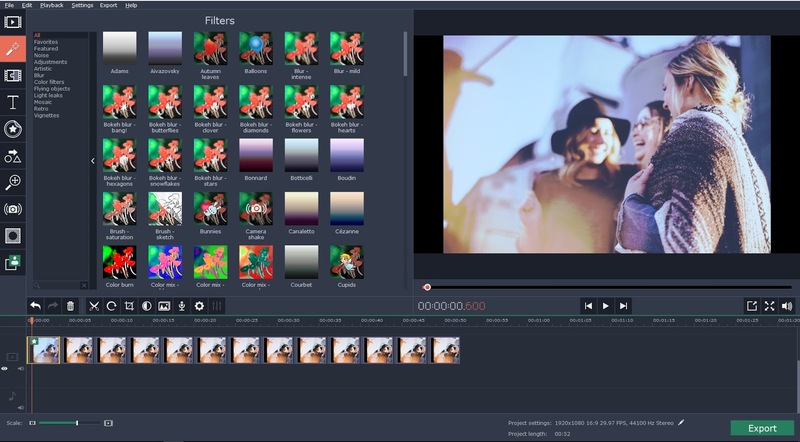 As an MP4 video editor, Movavi Video Editor has pretty much everything you’d need to improve, tweak and alter your videos. To get started you just need to load the MP4 video that you want to edit, or you could even import it directly from your AVCHD camera by plugging it into your computer. It is possible to capture additional footage as well, via your webcam or by digitizing analog video sources such as TV tuners, VHS tapes, and so on. Once the MP4 video has been added, you can set loose the entire array of Movavi Video Editor’s features to edit it as and how you please. Typically a good place to start is to merge and compile video clips, arrange them in the order that you want, and perhaps even split them into smaller segments and trim out any bits that you don’t need. If you want you could insert stylish animated transitions between any of the segments by dragging and dropping them into place. In many cases the quality of your MP4 may be lacking in some way or other, and Movavi Video Editor has features you can use to improve it. It is up to you to choose whether to manually adjust the color settings, or use the automated features to calculate and apply the optimal color levels. If you’d like your video to have a specific style or visual appearance, you could make use of the filters that are available as well. Another important area you may want to edit is the audio. With Movavi Video Editor you can add additional audio tracks containing anything you want, whether it is background music or a voiceover. It is possible to record a voiceover on the spot, or edit the sound levels as well. Make no mistake there are lots of other features in Movavi Video Editor that you could use to add captions, apply special effects, transform the frame, and much more. Quite simply the sky is the limit when you choose to edit MP4 videos with its help, and you can let your creativity run wild. More importantly, because it is intuitive and user-friendly, you won’t need long to figure out how all of its features work and apply them to your videos. This is a sponsored post written by a guest.